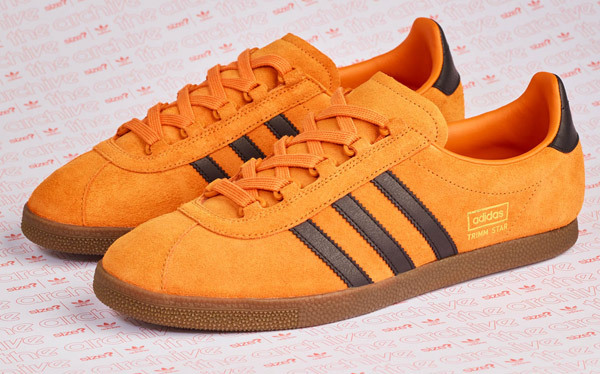 If you missed out on the claret and blue issue, you might want to get up earlier for the Adidas Trimm Star trainers in a pumpkin finish. Once again, this is a Size? reissue and a limited edition, also not widely available I’m afraid. Like all these launches, it’s a case of getting lucky online or getting up early and joining a queue at your local Size? store and hoping no one has done the same. Or at least, hasn’t got up quite was early as you did. The style of the show is as you would expect. 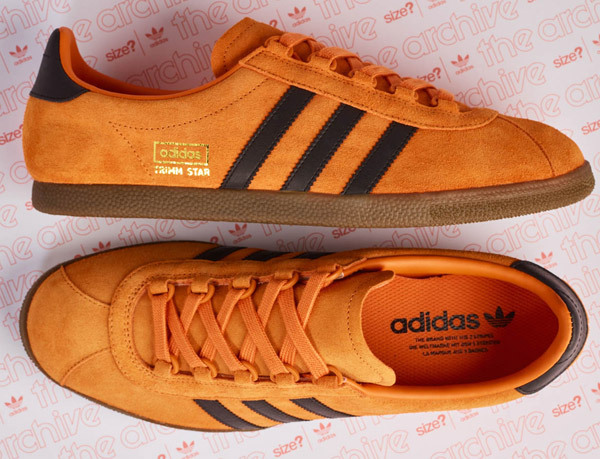 This is the Trimm Star, currently flavour of the month when it comes to reissues at Size? and no bad thing. It’s a timeless shoe. The shoe goes back to 1971. 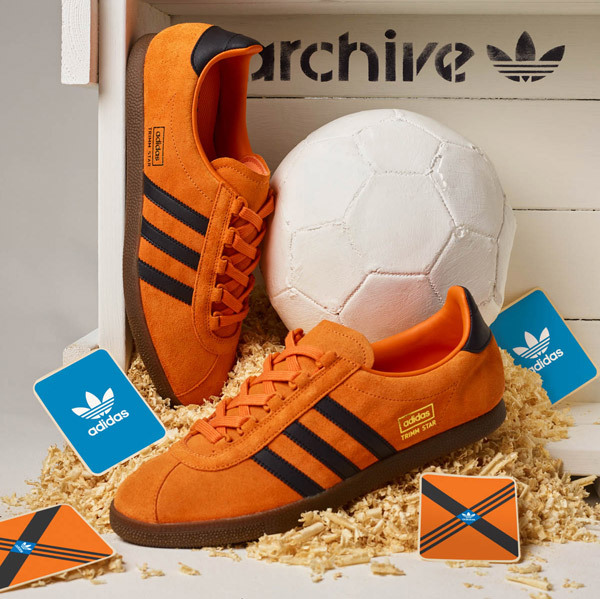 A lightweight, all-rounder, it was a training shoe that came out of a German sports initiative introduced by the government to get people fit and active. With a shoe like this on your feet, there’s really no excuse. Its detail – or indeed lack of it – has been the secret to its success over the years. A low-profile shoe with gold foil branding, embossed lettering moulded within the gum midsole unit and the trademark lacing system, which was designed to keep the shoe tightly on the foot during exercise. 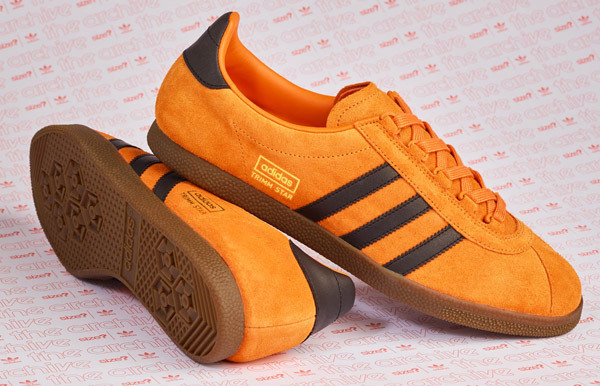 A suede upper of course, this one in what’s described as a pumpkin shade, matched up with some brown stripes and the same shade for the heel. It looks good. 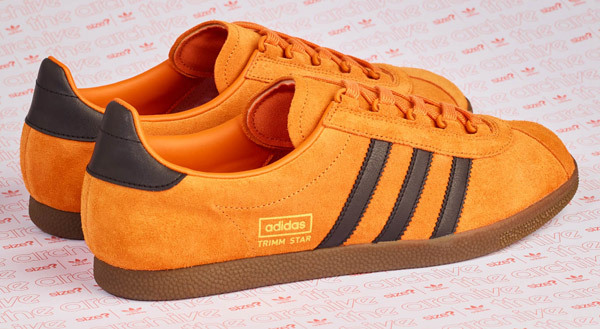 If you want this style on your feet, the Adidas Trimm Star trainers in a pumpkin finish will be available on Friday 10th August while stocks last, priced at £85.